On Tuesday evening we laced on our hiking boots, grabbed the bear spray and headed out for a hike on Storm Point Trail. With a beautiful and clear-skied evening it was a perfect evening to take a short hike (about 2 miles). After winding through an open meadow the trail comes through a wooded area and finally out onto a rocky outcrop overlooking Yellowstone Lake. Just when I started thinking about how secluded we were my phone let me know that I had a text message (I miss you, too, Judy!). Marmots were everywhere. They would venture out from their rocky homes and sun themselves on the rocks. Bears frequent this area, and in fact I have seen quite a few bears by Indian Pond these past few years. Though I would scan the open areas and through the trees there was not a bear to be seen. But it was not the bears that concerned me. When we started the hike I had seen bison in the area where the trail comes back out. If you have read this blog from the beginning you may recall that two years ago (June 18, 2009) my friend and I were charged by a bison in Hayden Valley while with a large group. It was possibly the most terrifying moment of my life. By the time our hike came back out into the opening the bison had moved on across the road. The scariest thing I saw on our hike was this rabbit. Lately my morning commute has benefited my wildlife viewing. Wednesday morning I saw a coyote (I haven't seen too many of them lately) and a grizzly and her two cubs on Swan Lake Flat. It was a beautiful morning that later become incredibly windy. The wind would whip through Park and eventually the roads were clogged with toppled trees. Canyon Village lost power at 2:00 pm and was still out this morning. The trees with their shallow roots and the sandy soil would creak and moan while some eventually would topple over. I have seen the aftermath of trees falling on vehicles and that is not a Yellowstone experience that I would care to have. So when I found myself rolling very slowly through a stand of trees Wednesday evening my thoughts were mainly about my auto insurance.....and my new primary physician. I found myself amongst these swaying trees while in a mile long bison jam. Since we moved along slowly I knew that somewhere ahead of me there was a bison slowly walking down the road heading in the same direction I was going. I would move along slowly while listening to wind and the cracking trees. Not a fun feeling. I finally made it up to the bison just in time to watch him move over into a pullout. Two cars later he moved back onto the road. And this morning I found this bison calf at 5:30 standing in the middle of the road holding up traffic (a total of 2 cars plus me). It was quite possibly the sweetest bison jam I have ever been in. I am still seeing bears, and lots of them. They seem to make an appearance everywhere I go. And thinking about it I have seen more grizzly bears than I have seen elk calves. Of course there are elk calves in the Park I just haven't been in the areas that they are. The last elk calf I saw was in the mouth of a grizzly. I also seem to come across the bighorn sheep. I see them constantly in the canyon on my way to Gardiner and on Sylvan Pass. The bison have made their way back to Hayden Valley this past month but even so the herd is much smaller than last year. I did get to watch a mama bison jogging down the road with its tiny baby by her side the other morning. The calves little legs were moving like cartoon legs in its attempt to keep up to its mother. I also think I have hit every bison/bear/wolf jam that has happened between Mammoth and Lake - or so it seems. The jams give me the opportunity to organize my cd case. I have moved on from my 'caught in a jam' car cleaning moments. There are some things that some may not consider when thinking about someone living in Yellowstone year-round. Besides the lack of cellular phone and internet service in a vast majority of the area there is also medical services to consider. There are wonderful seasonal clinics in Lake and Old Faithful and a year-round clinic at Mammoth. Employees in the Park have a mandatory deduction taken from their checks for Medcor, the Park's medical provider. This gives the employees a sort of medical insurance that is used only at the Park's clinics. And I used mine last week when I developed a case of the flu. I recovered and I also gained a primary physician here at Mammoth. Finally, after over two years, when I go to the dentist I can fill in that line where it asks for the name of my primary physician. Park employees here are also given the opportunity to purchase medical helicopter transport insurance. Though you may see 'villages' in Yellowstone no one should be lulled into the idea that Yellowstone is anything other than wilderness. A wilderness that at times can be congested, but wilderness none the less. Ambulance transport out of here on winding roads through bear/bison/wolf jams is not an option during emergencies. The sound of medical helicopters is a common occurance here. I am spending a lazy Sunday afternoon taking care of all the things that I didn't get a chance to get to these past few weeks. I finally was able to check my e-mail after neglecting it for over three weeks. After wading through 268 messages (does that darn Facebook really have to notify me everytime someone posts something on my wall) I finally narrowed my messages down to the important ones (thanks everyone who wrote to me!). Between loads of laundry I am also doing a bit of baking (a new passion) and with a lack of eggs I knew what I had to do - a trip to the Food Farm in Gardiner. I took a few deep breaths, a few deep knee bends and stretched and loosened my muscles and headed out to my next challenge: a left turn in Mammoth. Taking a left turn in Mammoth is not for the faint of heart or an inexperienced Yellowstone driver. And it is not for the impatient. I could hear the beat of my heart and the tick of the clock as I waited for a break in the traffic hoping in desperation that it would also coincide with a break in the pedestrians. Chances are it does not coincide. When I finally made my turn my next hope was that I could find a parking spot at the store. I did. Our next stop was the Cody Pow Wow. It was an incredible display of sound and color. I saw some of the most beautiful displays of Native American cultures. I got to be in the front row as the dancers made their way toward the area that they would be dancing. The rhythmic beat of the drums and awesome colors, feathers and bead work was mesmerizing. We spent some of our time watching the dancing and some of our time wandering the booths looking at all of the art and jewelry that was for sale all the while smelling the flatbread tacos that were being served up. The day had it all: sights, smells and sounds. This morning Jackie and I headed back into the Park under dark clouds and cool temps. It was raining during most of our drive and snow was being forecast for the higher elevations. I wanted to be back at Mammoth in time for the cookout that the store was having for the employees. Richard brought his barbecue to the store and cooked up some delicious hamburgers and hot dogs while others chipped in by bringing cakes and vegetables. I so enjoy the people that work at the store and everyone pulled together to pull off a wonderful lunch. A nice way to end a nice week. I seem to be doing a lot of road time lately. The previous week I made a trip to Fishing Bridge for a grocery meeting and this past week it was a liquor meeting at Grant (yup, a meeting about liquor! What a job!). My trip to Grant included picking someone up at Tower so I took off from Mammoth at 7:30 am and headed east....straight into a bison jam on the Blacktail. Then it was another jam of some sort by Petrified Tree and then I made it to Tower just in time to find out that Dunraven Pass had been closed due to a slide but had just reopened. We came across another jam by Fishing Bridge and this time it was a grizzly. And as it happened it was the same grizzly that I came face-to-face with a few mornings before. On my way back from the meeting it was yet another jam by Floating Island Lake, this time it was a black bear. Though I see some amazing sights during my drives I am now usually trying to get from point A to point B so I rarely take the opportunity to photograph or watch any of the wildlife. But I am always in the company of my trusty camera in case I do find a moment to snap the shutter. As the summertime crowds grow I am less likely to do so. I much more enjoy the quiet moments with the scenery and wildlife and I am more apt to see things closer during my early morning drives. I will wait until fall and winter before I go head on into my wildlife viewing drives when my camera spends more time up to my eye than laying quietly on the seat next to me. But I know when I see the lumbering bear or the wandering wolf quietly ambling down the roadway and it is just me and them I can casually reach over and grab my camera and capture the moment. The mornings are for me and my camera. And the weekends are for my travels out of the Park. While I head to Wapiti I pass numerous families excitedly driving into the Park for their adventure and I am equally excited to explore the region outside the Park. 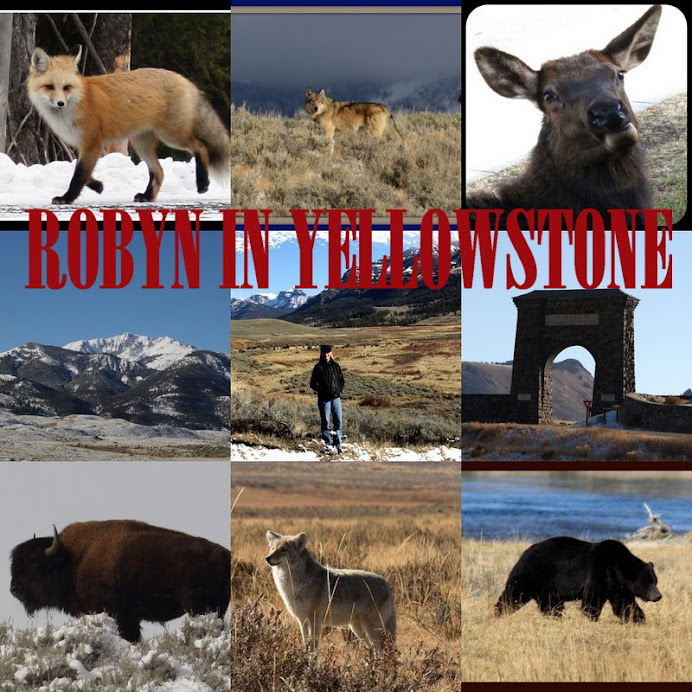 I so enjoy the history of the towns surrounding the Park and with a few ghost and mining towns under my belt from last summers excursions I spent this past weekend enjoying the sights and sounds of history in the Cody area. I picked up my friend Jackie from Canyon and she went to Wapiti with me to enjoy a few of the things that Cody has to offer. First on our agenda was meeting Patrick at Adriana's, an Italian restaurant in Cody (delicious!). The next morning Jackie and I spent the morning wandering the stores of Cody and then it was off to the Heart Mountain Relocation Center. During high school I took an entire semester of WWII history and not once was it mentioned that the US had relocation camps. I first heard about these camps when my dad told me that a coworker of his had been sent to one in California when she was a child. Between Cody and Powell is the Heart Mountain Relocation Camp, which is currently having an interpretive center being built. There are only a handful of buildings left where the camp once stood. They are boarded up but we could peer through some of the windows. Last year I bought a book about the camp for my dad. I had paged through it and looked at some of the pictures from the camp and read a bit about the history of the camp. Such a sad part of our history that so few people know about. Since I spend the entire week traveling the roads of Yellowstone my weekends are now reserved for Wapiti. My usual Friday evening is spent traveling there but this week I wasn't able to leave until Saturday morning. The day looked promising in Mammoth with blue skies and sun. After coming past Golden Gate and onto Swan Lake Flat I could see that my travels would lead me into different weather. When I got to Obsidian Cliff the sun disappeared and I continued on under the shade of clouds. I stopped south of Canyon at Wapiti Lake (last restroom break before going into Hayden Valley). It started to sprinkle and I could hear the roar of thunder. As I continued farther south the rain changed to sleet and snow and the road had a good inch of slush on it. It finally stopped as I hit Fishing Bridge but I could tell I couldn't dilly dally (as my mom says) if I wanted to stay ahead of the the coming bad weather. I stopped for only a moment to take a picture of the ice on Yellowstone Lake and I didn't even stop to watch a bear just before Steamboat Point. The rest of my Saturday morning travels were uneventful except for 2 bighorn sheep jams I came across as I came down Sylvan Pass. Sunday was a day for exploring outside the Park. Patrick and I took a drive down the south fork of the Shoshone River. I think I have found the most scenic and beautiful area of Wyoming that I have been in thus far (with the exception of Yellowstone, of course). With the bountiful supply of water from the melting snow there were plenty of waterfalls to be seen. The water would cascade and tumble down the mountains and the Shoshone was roaring with power. Far down the road we came across a winter bighorn sheep management area. I have never seen so many bighorn sheep congregated in one area. There were approximately thirty sheep lounging or grazing in a field while eight rams stood by the road and then leaped over the fence as we drove by. I could hear the fence twang as their hooves nicked it as they leaped over. I'm including this picture of this foal that we saw just because I thought it was so darn cute. It was an incredibly scenic drive and we found plenty of spots to hike in the future or to camp. Around every turn there was more to see and canyons to explore. The mountains had a cap of snow on them and with their melting they fueled the waterfalls that we saw. Our wildlife sightings included elk, bighorn sheep, mule deer and pronghorn. And then my weekend ends. I made the drive back to Mammoth this evening and was met with rain on Sylvan Pass and from Hayden Valley to Norris. I did manage to see a grizzly by Steamboat Point. There has been a sow with cubs there but I only saw one bear. I think I have seen more bears this past week and a half than I saw the entire summer of 2010. Tomorrow starts a new week, new adventures and new experiences. I'm loving my job here in Mammoth and I love the people that work here. I have seen quite a few Canyon and Grant people this past week, many stopping in the store here. I have also met a few blog readers and those I have missed have left me notes. Though I may not have anything profound to write at times it does inspire me. This blog has evolved these past two years and I'm sure it will continue to do so. I write about the people I see, the things I do and things I feel. And to be honest, sometimes I read some of the things that I wrote two years ago and think: "I can't believe I wrote that!" and sometimes I just think: "Wow, use the spell check!" One Step, Two Steps, Three Steps, Bear! My life seeing bears continues. I have to remind myself that there are very few jobs in the world where someone can be at work and spend the day peaking through the front window at a grizzly and black bears. Thursday was an incredible bear day in Mammoth. A grizzly took down an elk calf in Mammoth and drug the carcass up Capital Hill and then spent hours feasting on it. The entire YGS staff at Mammoth spent the day peering up the hill at the grizzly. If that wasn't enough a black bear ran in front of the store and up the hill to the west of the store. Mammoth was buzzing with visitors and rangers as they kept track of where the bears were. And again this morning a bear ran through Mammoth. I repeat: I cannot not see a bear. At the end of the day, with the grizzly still laying atop of Capital Hill, I left for Lake. I could tell something was up the moment I pulled into my parking spot at the apartment there. The apartment overlooks the horse corrals and Yellowstone Lake. People were lined up at the east side fence of the corrals and after a careful surveillance I saw what was drawing all the attention: a grizzly. It was roaming and digging in the corrals. As I prepared dinner I would occasionally look out and watch the grizzly walk around inside the fencing. I also had to remind myself that not everyone gets to live in an area where they can watch a grizzly as they prepare a salad. Needless to say that this morning I was extra careful to survey the area as I left the apartment at 5:15. I looked out the door and saw nothing. I started down the boardwalk toward my car: one step, two steps, three steps, bear! Walking directly towards me, between myself and my car was a grizzly bear. Between the early morning light, the brown of the garbage dumpster and the dirt and the darkness of the pavement I didn't even see it. It was the movement that caught my eye. With one giant Abraham Lincoln-sized step I was back in the door. I ran upstairs to get Patrick who followed my back downstairs to the door. With the door having a full-length glass pane we were able to watch the grizzly saunter past peering inside the door at us. After it passed Patrick stepped out and shouted at it and clapped his hands. It lumbered off and I breathed a sigh of relief. I have seen many many bears in the Park but this was my first experience seeing one outside the comfort of my vehicle or a building. Though it hasn't warmed back into the 80's as it had the other day the sky has been mostly clear these past couple of days. An occasional blanket of clouds may drift through but the blue skies and sun that we see for most of the day definitely make up for the lower temps. Dunraven Pass is now open as well as Beartooth Pass. And life is much easier since Sylvan Pass has remained open during the daytime hours. Snow may occasionally close the passes but it is moving in a positive direction. There is still plenty of ice on portions of Yellowstone Lake but it is quickly disappearing. I think that spring was skipped over in Yellowstone and we are heading from one long winter straight into summer. I thoroughly enjoy my morning drives from Lake to Mammoth. This morning was especially nice even though I started off the morning with a grizzly bear and a coating of ice on my windshield. As the sun rose it showed a brilliant blue sky. Electric Peak was gorgeous. The long winter seems to be over. I guess it started a year ago. It was when then that I noticed that people that I knew started waving at me when I traveled through the Park. Or that I started running into people as I shopped in the neighboring towns. The villages in Yellowstone are like small communities of people and you are eventually bound to come across them as they live their regular lives. I remember the first time that someone waved to me as I drove through Gardiner, or the first time I ran into someone shopping at the Food Farm or a store in Cody. And this past spring I started seeing people that I knew in Bozeman. Coming from a small town I know that sometimes it can take years before a person is considered a 'local' but I have slid comfortably into the title of 'local' in the Mammoth community, and a formal local in the Canyon community. As my boss says: "Robyn, you were meant to be here." And here I am. A warning to all English teachers: bad grammar ahead. I also have come to believe that I cannot not see a bear. These past few days I have been seeing grizzly bears in the Mammoth area, by Norris, in Hayden Valley and by Fishing Bridge. No matter where I go I am seeing bears. What a treat for me. On Saturday, after a day of seeing people I know in Bozeman, I traveled to Wapiti. Though Sylvan Pass is currently open during the day this past weekend it was only open 8:00 pm through 10:00 am. Right before Lake Butte Overlook there is a washout of part of the road and a traffic signal was put up because of the one-lane travel. Sylvan pass also had a temporary traffic sign put up warning motorists not to stop for 2 miles over the pass because of avalanche danger. On my return on Sunday night I came to the East Entrance at 7:45 only to be greeted with about 50 other motorists waiting in line to go across the pass. I didn't go through the gate until 8:30. Though it is June 8 it still snows throughout the Park. We were warmly greeted with temps in the 80's earlier this week but lately we are lucky if it gets out of the 40's. I have driven through snow these past couple of days, mostly in the Lake and Canyon areas. Today was an overcast and dreary day but the crowds in the Park have started to build. With vacations planned months in advance for many visitors they have little choice but to enjoy the Park with the weather that they are given. Though you may have to bundle up a bit there is plenty to see and enjoy here. Baby bison, elk and bears are making appearance and that alone is worth the visit. Your body may be chilled but there is plenty to see to warm the heart. I travel through the Park on a regular basis. I drive from Mammoth to Lake, when I am able, in the evenings. Yesterday evening I managed to drive through four bear jams. I have now seen a grizzly just south of Roaring Mountain twice this past week. I've had a clear view of it both times but I never managed to get a photo as I had to maneuver between cars and pedestrians. Jams of any sort can be a dangerous situation as many people are focused on the bear/bison/etc. instead of where they are walking or driving (or opening their car doors). On my way back to Mammoth in the mornings are delightful. I leave Lake at 5:15 am and I usually have the road to myself......except for Tuesday morning. As I drove west from Canyon Jct. I noticed something dark in the road ahead of me. To be truthful I momentarily though of a leggy goat that I once had named Elmer but this leggy creature was actually a wolf. It would not leave the roadway so I pulled off the roadway and watched it pass my car. I had my window open and I could actually hear its nails tip tapping on the pavement. Just past my car it left the roadway and I watched it wade through the snow and off into the woods. It was just the leggy wolf and myself. I thought about how thousands of people travel thousands of miles to watch a wolf through their spotting scopes. My day of wildlife was not over. I newborn elk calf was wobbling around with its mother behind the store. It was a definite "aaaaah" moment. But earlier this week a bear took down an elk calf across from the store. I also have seen baby sheep on my way to and from Gardiner. The weather has vastly improved these past couple of days. The snowfall in Mammoth has been replaced by sunny skies and 70 degree temps. It is a glorious feeling to soak up those rays. It is hard to believe that it was snowing just two days ago. The rock slide between Mammoth and Tower has created problems for those driving through the Park, especially those having business on the other side. But it should be open for regular travel within a couple days. The rivers are swollen and flowing fast because of the snowmelt at the higher elevations. It has been a long spring.